Maybe all your data comes from sources that already have existing Telegraf plugins, but I’m guessing that’s not the case. I’ve made extensive use of the http Telegraf plugin so far, and I’m working on a project that uses the MQTT plugin, but I have been thinking about writing my own plugin as well. As you’re all aware, I make pretty extensive use of the Particle.io Photon around here—mostly because I have a bunch handy, but look for some work with other IoT devices to come in the near future! 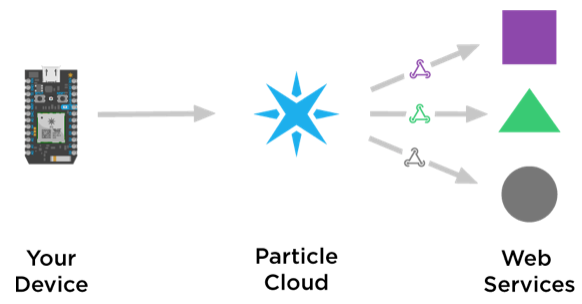 I’ve mostly hacked my way around the Particle Cloud so that I could insert data directly from the Photon device into InfluxDB directly, but for this exercise, I thought I’d build a Telegraf plugin that can interact directly with the Particle Cloud’s Webhooks architecture. 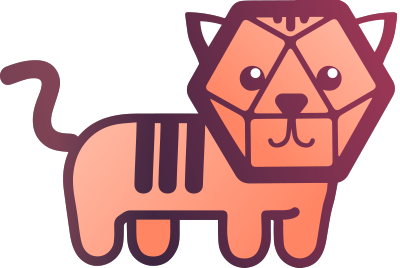 First we’ll look at the existing Webhooks plugins to get an idea of how they’re built and structured, and then we’ll modify one to create our own Particle.io Webhooks Telegraf Plugin. Pretty straightforward, and what we will be building will be one of the ‘Web Services’ shown above. 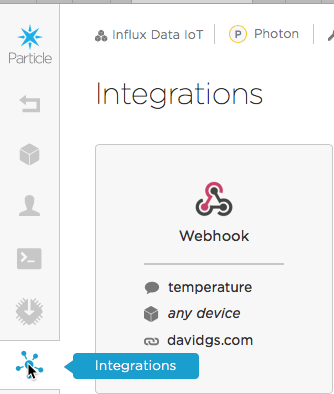 So, off we go to our Particle.io Console to create a new Integration, and choose ‘Webhook’ as the integration type. I’ll be adding this web hook to my existing IoT demo project, so I’ll set the Event Name to ‘temperature’ and for the URL, I’ll use the URL of my Telegraf instance in the cloud. And I was ready to go. I can then see in the Particle Web Console that ‘temperature’ events are being published every second. So now it’s on to making a Telegraf plugin to pull those events into InfluxDB! On GitHub there is a whole section of nothing but Webhooks plugins for services like GitHub itself, Rollbar, etc. So we’ll start there and look at the Rollbar plugin. I forked the Telegraf repository into my own account so that I could change it to add a Particle plugin. (Note: I had to fork all of Telegraf to do this, but that’s not a huge deal.) And now that I have it all here, it’s time to dive in. First, I simply duplicated the entire Rollbar directory and renamed it ‘particle’ and then started making the changes I wanted. The two files I need to change are ‘rollbar_webhooks_events.go’ and ‘rollbar_webhooks.go’ but the first order of business is to change everything that says ‘Rollbar’ to say ‘particle’. A global replace inside all the files for ‘Rollbar’ to ‘particle’ and ‘Rollbar’ to ‘Particle’ is also in order. Fairly straightforward, and even as a non-Go programmer, I was able to figure out what was going on here and get it working. The trickier bit, for me as a non-Go programmer (yet!) was the next part in ‘particle_webhooks_events.go’ so I had some help. Let’s go through that a little, in case it’s as confusing to you as it was to me. First is the ParticleData struct which lays out the fields that I’m interested in from the incoming json object. That was clear enough to me. The two mapping functions were less clear. Basically, they map the “coreid” field in the ParticleData object to the ‘id’ tag in my database, and then map the ‘Data’ field to the ‘temp_f’ field in my database. There’s a little hitch in there wherein I had to convert the Data field to a double value from a string because the Particle device can only publish INTs and Strings. Now it’s time to talk a little bit about the particle device itself, and the whole json business from Particle. We already changed the output from the Particle Device itself to publish the temperature data, so that works fine. Next, we have to go into the Particle Console and define the Webhook for the published event. That will force the data to be sent to your endpoint as json. Why it works that way I have no idea, but it does. 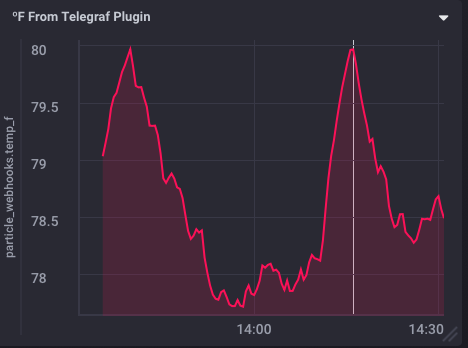 And now, with my custom-built version of Telegraf, and my newly defined Webhook from Particle, my device is sending data to the InfluxDB instance via my Particle Telegraf plugin. This was a surprisingly easy task, other than the debugging of weird behavior thanks to json shenanigans. With some help from a colleague on the GO side, and then a bit of further work, writing the Telegraf plugin took me about a day or so. Ultimately I’d like to expand and generalize it a bit so that it’s not so specific to my needs—have it parse the readings that it is sent, and put them into the database based on other fields in the json—but for now, I have a Particle Telegraf plugin that logs the data I want.